EPBOT: Saturday Steam: Disney Style!! Quick backstory: Christina and her hubby came to WDW for their honeymoon last January, and they wanted Mickey ears to reflect their steamy interests (mrowr). So, naturally, they made some themselves! "The Earl Grey is an old style Mickey Groom Hat. I took off the ears and covered the hat with an embossed faux leather. Mr. Grey hand patina'd the ears and I cut a keyhole in one before attaching a keyhole cover." "The hat band is a linen measuring tape and the hat is striped with brass upholstery tacks (trimmed for safety). The final touch is two old fashioned loupe lenses in the band. "The Lady Grey is a fascinator rather than a true hat. The headband portion is made of the same faux leather as the Earl Grey. The ears are the gold see-through Disneyland 50th anniversary ears and the right one has been embellished with a line of gears. "Mr. Grey painted a pair of welder's goggles with gold and bronze paint and they are affixed to the headband along with a veil made of Russian netting." YOU GUYS. I...I don't own any Mickey ears. Can you believe it? 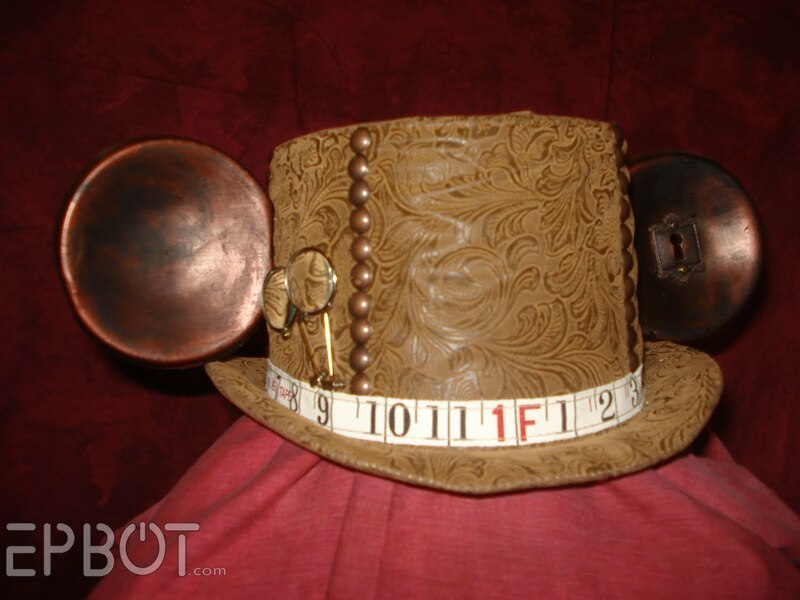 Don't ask me how this is possible, because now I HAVE TO BUY MICKEY EARS AND STEAMPUNK THEM OUT. 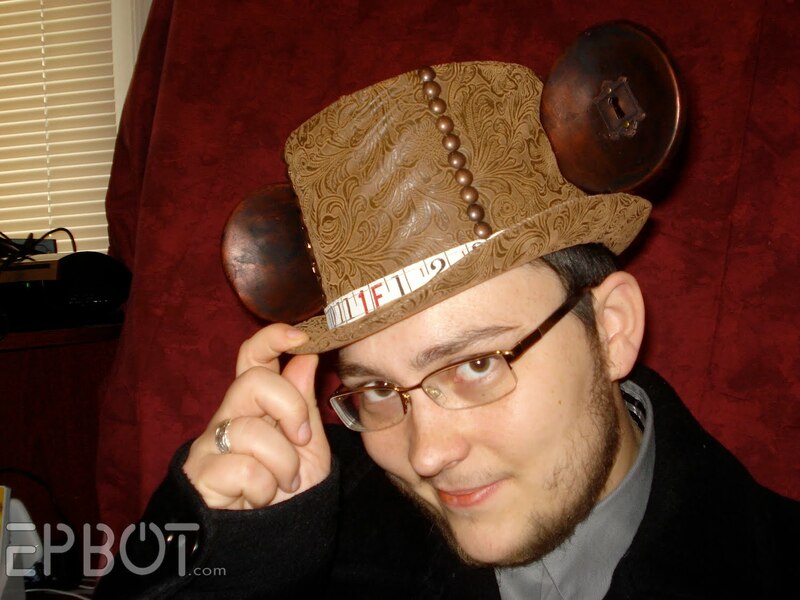 Oh yeah; and the steampunk ears are super-awesome! I'm noticing the last two posts are wedding related. Jen, are you and John planning to renew vows with an amazing Disney/Star Wars/steampunk super-theme? 'Cuz that would be so great! 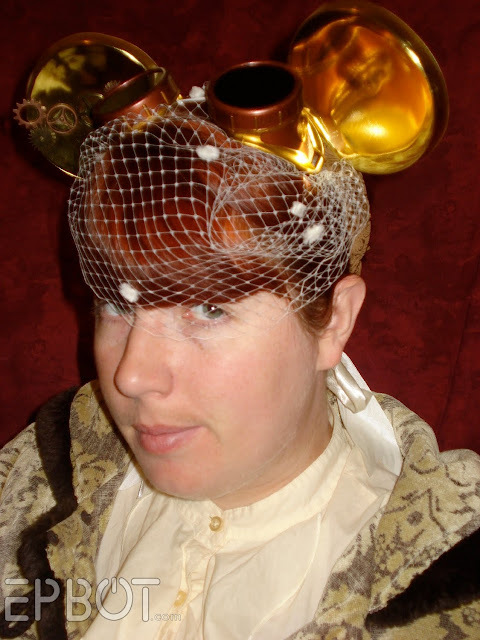 Those are awesome Steampunk ears! I love the details they used. So cool!!! Oh my Goodness! I saw Christina and Hubby while I was in Disney in January! I saw them everywehre and I even asked to take their picture in line for Peter Pan! Love these hats! What a small world! I have so many ears it's ridiculous (used some to make Mickey Easter bonnets for my kids when at DLand for that holiday-cut off the ears and attached them to their easter hats). How can you not have any ears?? 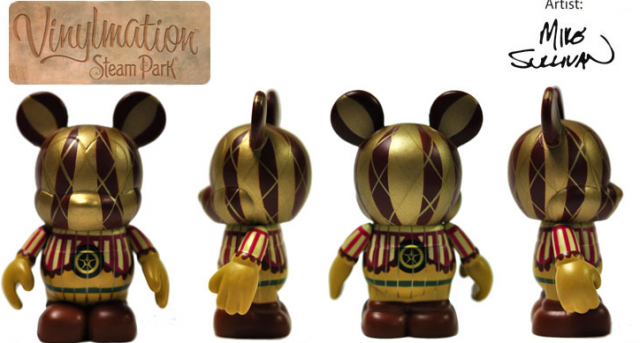 Not being a WDWer, I can't say for sure, but I would assume there's a WDW outlet store near the parks (as there is one near DL) where they usually have discontinued ears on the cheap (they're even still selling the 50th ears-they MAY have made a few too many). Sometimes you can get them for a buck or two. There's traveling outlet stores, too, though they don't carry as much merchandise. My husband and I went to WDW for our honeymoon and tried to get them to put both our names on the set of ears we bought but they wouldn't. I then tried to convince them my name was Jodee-n-Mike but they didn't believe me. They really should have done it for us... the big jerks. But I have them around here somewhere, I am sure. Now we just need to get them to make a movie with a steampunk princess, and we'll be good to go. Saw these on a post from io9.com. They are awesome! So is her other work. Holy crap, I know them! I went to college with both of them. I knew they'd gotten married but not that they had steampunk Mickey ear hats. Jealous. Yeah, what a PP said... Definitely check out the outlets there near the park... 2nd would be Ebay, they've got some random stuff there (I just checked) and in doing so, reminded me I've got a pair of ears that I'm not exactly attached to.. I actually got them from the outlet in Ft lauderdale when I was home visiting the parents. I could give 'em to ya. I'll drop an email to you from the contact page..
On a mostly-unrelated note, I went to the bank with my boyfriend today and they had the vault open. The inside of the vault door and the gate were so beautifully steampunky that we started getting weird looks because we were wondering out loud how one might remove such a door from the wall (not to get inside, just because we want the door!). And then when we went outside, there was a giant steampunky clock tower. I couldn't help but think of you. Thank you all so much for your kind words about our Steampunk Mickey and Minnie ears. We got a great response at the parks (we're considering wearing them the next time we go...even though we won't be honeymooning). @Jess - We TOTALLY remember you! The Epbot family is close and mighty!! We hope you're having a great 2011. @ithenwokeslowly - I KNOW YOU!! I hope you are super-well. Will you be back in the old haunts any time soon? I still work at the Playhouse so could probably snag you some tix. I would love to have coffee or something! 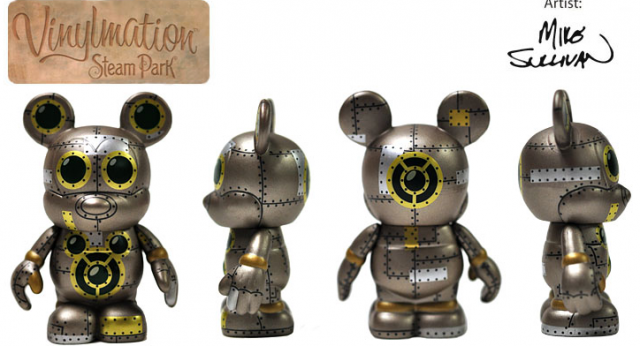 not a fan of mickey mouse, but have to admit those are very cool. 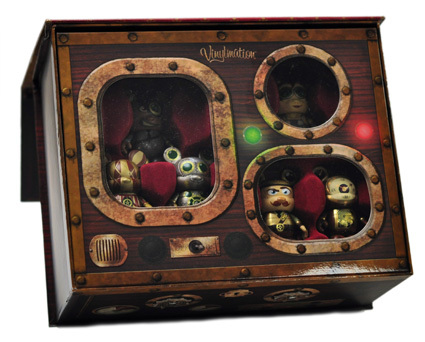 Speaking of steampunk, I didn't know if you had seen this yet: Steampunk Ghostbusters art! Hey! Have you seen the new HGTV show "My Yard Goes Disney"? Looks like it could at least give inspiration to a new project or two. Wanted to make sure you saw this steampunk inspired wedding over at Style Me Pretty! 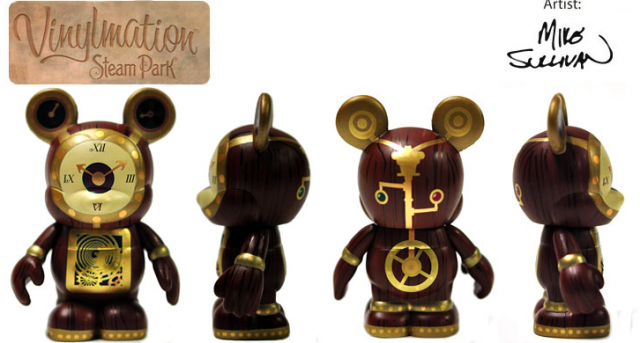 heads up Disney also released Steampunk pins based on beloved characters. 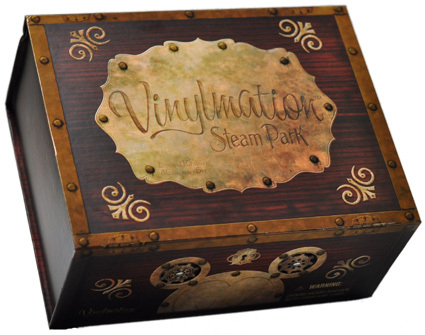 I just bought a steampunk Stitch pin. I can send pictures if you want to see them. JEN! Have you seen this Etsy store? It made me think of you. Oh, how I wish my 6 month old and grad school would give me enough time to pick back up on my costuming! I know these two and they are this cool all the time! So glad to see them featured on a site I also adore!